Empower your staff to manage infrastructure, lands, referrals, and use and occupancy data. Proactively manage Title and Rights by maintaining a full record of your engagement with all proponents. 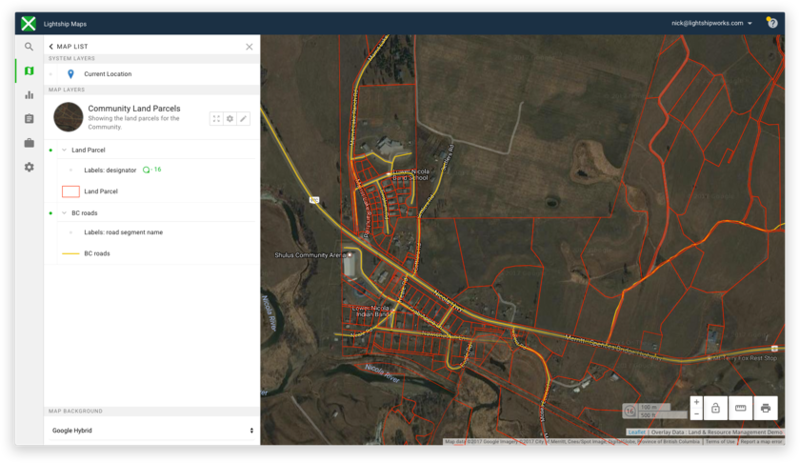 Use your custom map to track engagement, and be able to click on any proponent footprint to view all the associated details. Easily update leadership and your community using interactive maps that show the locations of all activities, past and present. Effortlessly visualize the cumulative effects of proponent activities in your traditional territory. Data can be shared with groups of users, or you can send someone a secure link to share a resource temporarily. These secure links expire automatically after a defined number of days, keeping your data secure. Track multiple referrals and include files, photos, correspondence, deadlines, and staff responsibilities. Access and view the full history of any lands process in a single click. Keep a record of multiple leases, rental agreements, and other major land development projects organized by parcel. Streamline community engagement on development projects by providing interactive maps showing locations and considerations. Maintain a clear and organized record of documents associated with the lands management process prior to submission. Streamline community engagement on development projects by providing interactive maps showing locations and considerations. Monitor your infrastructure from desktop & mobile through a single, integrated platform. Plan for the replacement of aging infrastructure with a tool that streamlines your existing daily work. Use any computer or mobile device to inventory assets, track inspections and maintenance, and run queries and summary reports. Fill out customized data capture forms on any mobile device, even in areas with little or no cell reception. Store locations for critical infrastructure and other other assets, such as fire hydrant locations, and be able to share this information with emergency responders and other agencies if a critical event occurs. Save time on data entry. Lightship’s simple, shareable forms streamline data collection, minimizing errors during capture, reducing risk of data loss, and eliminating time spent on data entry.